What Causes Brown Spots on a Refrigerator? A power failure can be a major inconvenience. Suddenly, one of the things that you've come to rely on in your day-to-day life, electricity, is taken away from you. A loss of power can be more than just an inconvenient; it can cause you to lose money as a result of thawed food in your refrigerator. A damaged refrigerator can also suddenly spring a leak following a power failure. A refrigerator that leaks after a power failure should be repaired. One of the first things to determine when your refrigerator is leaking after a power failure is where the leak is coming from. This will help you determine the part of the refrigerator that needs inspection and repair. If the leak is coming from around the freezer door, for example, you should concentrate your efforts in that area. A leak coming from underneath the refrigerator could indicate that the drain pan has overflowed or has been damaged. The seals around the freezer and refrigerator doors keep the cool air sealed tightly inside the appliance. Over time, these seals are exposed to both the cold air inside the refrigerator and the warm air of your house or apartment. This can eventually lead to cracks and deterioration, resulting in leaks. Replace a leaking seal by ordering a replacement part from the refrigerator manufacturer. These can be installed with a basic set of tools. The drain pan sits underneath the refrigerator, and it catches the water that condenses on the inside of the refrigerator compartment. During a power failure, all the ice in the freezer compartment can melt and make its way through the refrigerator and into the drain pan. When enough water fills the pan, it can overflow. Remove the drain pan by first loosening the grill on the underside of the refrigerator door. Empty the contents of the pan into a sink. Replace the pan and refrigerator grill. Another cause of a leaking refrigerator after a power failure could be a hole in the refrigerator cabinet or shell. The interior portions of refrigerators are typically made out of a reinforced plastic, encased by a shell of harder material. If the inside cabinet is damaged or cracked, this can harm the structural integrity of the refrigerator. 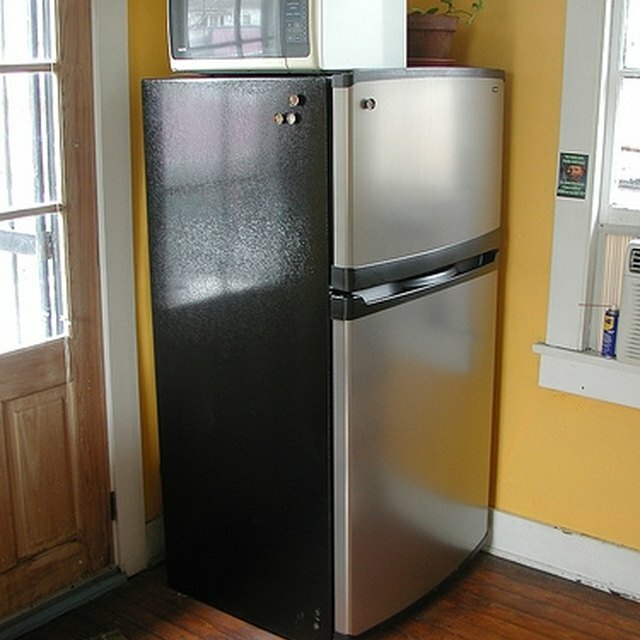 During a power failure, as the freezer thaws, the water makes its way down through the refrigerator. If this water happens to meet a crack or other opening before it gets to the drain, it will begin to seep out. Check for damage inside the refrigerator cabinet, and, if the hole is small enough, repair it by hand or with a plastic repair kit. Otherwise, the entire refrigerator may need to be replaced if the damage is major. How Can I Ruin My Refrigerator? Why Does My Refrigerator Leak Out the Bottom?